Imagine waking up one day and noticing that a small patch of your skin is fading in color. You might think nothing of it until that patch gets larger – and more patches follow. During an online search of your symptoms, you discover a funny sounding word called, ‘vitiligo.’ You read about the condition and are relieved to learn that it isn’t painful and doesn’t present a health danger. But still, you’re worried. What should you do? If you come to Price Skincare Clinic, Dr. Price and his team will help you understand vitiligo, teach you how to live with the condition and even look at treatment options. “Often, just having someone to talk to about your condition, understanding its cause and symptoms and what to expect relieves fears and concerns patients have,” said Dr. Price. Vitiligo is a skin disease caused by the loss of melanocytes, which are the cells that give color (pigment) to the skin. The tell-tale signs of vitiligo include the loss of skin color in the form of white patches of skin on the body. The condition can be localized in one area of the body or it can spread to several different areas including the mucous membranes (inside the mouth and nose) as well as the eye. Patches may appear on hands, feet, arms, face and lips as well as other parts of the body. No one really knows what destroys the melanocyte cells although many health experts believe that it is an autoimmune condition in which the body attacks and destroys these cells. Unfortunately, there is no known cure for vitiligo. 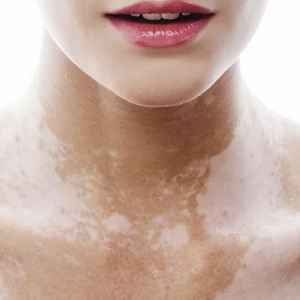 Who is most at risk for vitiligo? • Vitiligo may also be associated with other medical conditions such as thyroid dysfunction. • Although vitiligo is more noticeable in those with dark skin, the condition affects all races and both sexes equally. • The disease tends to run in families, which means that it may be genetic. • Most who contract vitiligo will do so before the age of 40 while about half develop it before the age of 20. One of the most promising treatment options Price Skincare offers those with vitiligo is a new XTRAC laser therapy, which can reduce the severity of the condition.